In the oversaturated world of iGaming, Webbyslot Casino comes with a completely refreshing approach that’s innovative, entertaining, and rewarding. Webbyslot Casino is both an online casino and online sportsbook. It’s a complete package for those who love flirting with the lady luck. Webbyslot Casino features a modern, instant-play interface. The fast interface works perfectly with the Rugby theme of the website to create a high tempo vibe that’s infectious. It’s befitting too, considering that the sportsbook is replete with sports markets that can disappear if you are not fast enough to grab them. So, how does Webbyslot Casino fare on various aspects? Well, let’s check out. The reward system at Webbyslot Casino is a highly lucrative and pleasantly surprising aspect of the casino. No matter how much you get used to the casino’s reward system, it will still surprise you. For starters, all new signups qualify for 100% deposit bonuses that run into hundreds of euros. There are also hundreds of free spins on offer for the players. However, the best part about Webbyslot Casino is that its best players get multiplying benefits. Their winnings are multiplied. Their free spins are multiplied. Their fun is multiplied too. The rewards system on the website follows the rugby gameplay. Players have milestones to reach, and once they reach them, they are awarded different prizes. Webbyslot Casino is operated by SG International and is promoted by Alpha Affiliates. SG International is not a new player in the industry by any definition. It has many famous names to its credit including Wild Wild Bet Casino, Nissi Casino, and so on. So, the trust factor is strong with Webbyslot Casino. Besides, Webbyslot Casino boasts of a gambling license from the Government of Curacao and is regulated by Curacao eGaming. Therefore, the legitimacy of the casino is unquestionable. Also, the casino’s website is protected by 128-bit AES encryption, so that your personal details and money on the site are safe and secure. The sportsbook on Webbyslot Casino is one of the most comprehensive, delightful, and insanely fantastic service. There are dozens of sports supported on the platform, and that means hundreds of sports markets in total. At any given point in time, close to 100 live games will be available for betting on Webbyslot Casino. Some of the sports available for betting on Webbyslot Casino Are Soccer, Tennis, Basketball, Volleyball, Ice Hockey, Baseball, Boozing, Cricket, Curling, Darts, Rugby (obviously), and many more. Webbyslot Casino offers over 2400 online games from 30+ game developers. That’s enough to entertain any punter for years, if not decades. Webbyslot Casino has everything you desire – slot games, table games, live casino games, progressive jackpots, and more. The lengthy list of game developers hosting their games on Webbyslot Casino goes on like this NetEnt, Microgaming, Playson, Pariplay, MrSlotty, BetSoft, Endorphina, Evolution, Amatic, and so on. It’s a gambling festival on Webbyslot Casino every day. 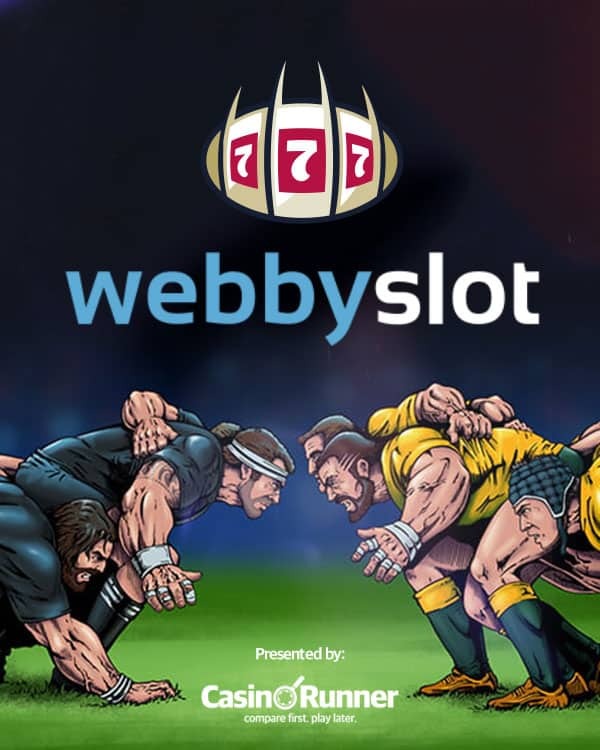 The Webbyslot Casino website makes brilliant use of its Rugby theme to get the visitors all energised during their time on the platform. The graphics, animations, and even the most popular games on the platform are sports-themed. So, players are in for high-intensity online gambling the moment they are on Webbyslot Casino. The website supports multiple languages, including English, Russian, and Spanish to make it easy for Europeans and people from elsewhere can access the site in a language that they are most comfortable with. A simple layout makes it quite effortless for the players to create an account, login, and start playing the games and betting on the sports markets of their choice. Webbyslot Casino offers multiple payment methods on its platform for its players to make transactions. The various payment options include VISA, MasterCard, Skrill, YandexMoney, Qiwi, Neteller, Paysafecard, Wirecard, Neosurf, Orangepay, and Moneta. The availability of so many options makes it easy for players from a variety of countries, especially those from across Europe, to transact on the casino conveniently. The customer support executives at Webbyslot Casino are friendly, reassuring, and understanding. They are knowledgeable and try to resolve the customer issues on priority. Whether you reach them via email, live chat, or even phone, they are always quick with their responses and see to it that your issues are resolved swiftly. This is welcoming because players tend to upload hundreds of euros on the casino and need a good response from these people to feel that their money is safe. Thousands of games, thousands of sports markets, hundreds of euros worth of bonuses, and countless hours of fun – what’s there to not like about Webbyslot Casino. It is one of those gambling platforms that you get in and never bothered to look for anything else. With Webbyslot Casino, you’ve found a new online gambling haven.